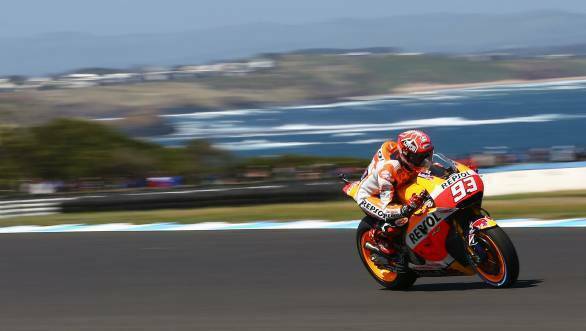 Marc Marquez took pole position for the Australian MotoGP round at Phillip Island with a blistering time of 1min 28.364sec. This was the Spaniard's eighth pole of the season. Also qualifying on the front row of the grid was Ducati rider Andrea Iannone, with Movistar Yamaha's Jorge Lorenzo third. Valentino Rossi, who leads the championship, had to be content with seventh spot, which puts him on the third row of the grid. While Rossi initially looked like he'd have a spot on row two, a quick lap from Dani Pedrosa during the closing stages of qualifying, which gave the Repsol Honda rider fourth place on the grid, meant Rossi would be pushed down to seventh. This means that Rossi will need something of a miracle at the start of the race at Phillip Island if he is to have any hope of catching and finishing ahead of team-mate and title rival Jorge Lorenzo. While Lorenzo trails Rossi by 18 points, the Majorcan rider has said that he needs to finish ahead of Rossi in Australia and certainly needs to claim some points from him, if he is to have a hope of a third world title. Meanwhile, the determined 36 year old Italian is certainly hoping to pull something out of the bag if he's meant to defend his lead in the championship. Rossi admitted that the Yamaha crew on his side of the garage certainly have their work cut out for them if they need to overcome the speed advantage that Marquez, Iannone and Lorenzo appear to be displaying. Also ahead of Rossi are riders Cal Crutchlow and Maverick Vinales. While Aleix Espargaro, Pol Espargaro and Andrea Dovizioso round up the top 10 on the grid at Phillip Island.